If you live in Alberta and you’re a cyclist, you’re likely aware of the two big rides happening to raise money for the fight against cancer. The more established one, the one we likely all know at least one participant of, is of course, The Enbridge Ride to Conquer Cancer. The other is new. It’s the Ride with Lance Armstrong. Both are going to be vying for your cycling and fundraising efforts this summer, so just how then is a rider to make the call. Which ride will you choose? For me, ethically, or morally, there really isn’t a wrong choice here as both clearly offer the chance to raise money for very worthwhile causes, so I wanted to take a moment and check the tale of tape, as I see it. Starting with The Enbridge Ride to Conquer Cancer, if you’ve seen the commercials you’ll know this is a BIG event. Hundreds and hundreds of riders take part in this 2-day, 200km ride through the Rocky Mountains. You’ll be fully supported, well fed and cared for and get to test your metal along with other impassioned cancer fighters while enjoying the amazing scenery. To me, this part sounds like a lot of fun. And then your hard work and the money you raise will go to support the Alberta Cancer Foundation, which is great as well, because the ACF is the sole fundraising organization for both the Cross-Cancer in Edmonton and the Tom Baker in Calgary. If you, or someone you know has been treated for cancer here in Alberta, it was more than likely at one of these facilities. The ACF offers fundraising opportunities for Albertans, in Alberta – I’m behind that. Your minimum entry is to raise $2,500, which is a challenge but still very doable for most people making this event fairly accessible to anyone who wants to join in. On the other hand, there is The Ride With Lance Armstrong. This as well, will undoubtably be a great event, offering Lance fans and cancer fighters alike the chance to ride with Lance for 1-day, 100km through the Edmonton River Valley and Edmonton area. This sounds like a once in lifetime opportunity – I mean how often does Lance Armstrong come and ride in Edmonton? I’m guessing this will draw out huge interest for participation, though I’m also guessing, from what I was told, with a minimum donation of $25,000 this might weed out some of the masses. I’ll be interested to see how successful this will be. I suppose though, if just 20 people pony up, the Canadian Breast Cancer Foundation (another fantastic organization) will benefit to the tune of $500,000, and that’s not unreasonable. Who knows, they might get a lot more people than that, and personally I sincerely hope they do. From what I can find, there is no webpage up yet, but for those seriously interested, there is an information session on the ride and the whole event, including the gala dinner and so forth at the Royal Glenora Club. You’ll need to RSVP to Courtney if you want to attend though. 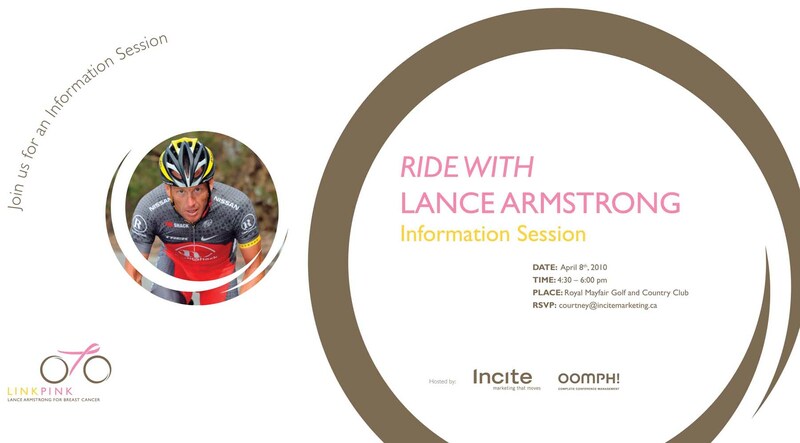 Click the Ride with Lance Armstrong image to view the invitation. Methinks Lance should let me ride for free, then he can probably charge $30k a head… I mean, I’ve got to be worth the extra $5k for sure, right? You forgot about another long running, widely ridden event – the MS 150. It has a long history and rides across the country too!